The two Appalachian Trail hikers pictured go by the trail names (left to right) Peregrine (wandering falcon) and Pyrite (fool’s gold). They had just finished climbing Mt. Katahdin in Maine, the northern terminus of the 2,178 mile-long Appalachian Trail. 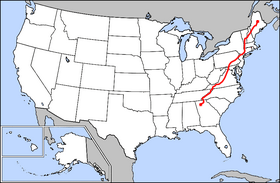 Peregrine (Heyward Douglass), from South Carolina, began on March 12th and finished six months later on September 20th. Pyrite (Mike Hurlburt), from Florida, first began in April of ’09, but damaged his leg after 800 miles and had to leave the trail. Family commitments kept him off the trail last year, but this year, on May 1st, he began from where he’d left off and finished on September 20th. This itself is remarkable; from what I’ve read, most hikers who leave the Appalachian Trail because of injury don’t come back. Pyrite saw over seventeen bear in Virginia, New Jersey, and New York. He also saw five moose in Maine and one in New Hampshire. Peregrine said his toughest day was in Palmerton, PA, where he was exhausted and ran a 102.7 degree temperature from influenza. During the hike, his backpack weight averaged forty pounds. His longest hiking day was 28 miles in Virginia. When asked if they would do anything different in their preparations for hiking the forests and mountains of fourteen states, both said that they would have done more research, especially on equipment–“We bit off a little too much to chew.” Both claimed that they had heard so much about the tough going in Maine’s dreaded Mahoosuc Notch that when they got there they were up for it and didn’t find it overly difficult. The same for Mt. Washington, Mt. Madison and many of the others. Both men enjoyed their thru-hike. Congratulations to Peregrine and Pyrite. They, each in their own way, set a tough goal and kept to it. We salute you! This entry was tagged Appalachian Mountain Club, Appalachian Trail, backpacking, camping, hiking, long-distance hiking, mountain, outdoors, thru-hiking. Bookmark the permalink. Congratulations to both Peregrine and Pyrite – an amazing achievement! Thru hikers can be obsessive about researching equipment, driven primarily by the need to keep pack weight down. I’m the same, but over the years I’ve learned that it’s better to start out with less than more, anyway. There are so many outfitters around (particularly on the AT) that you can always pick up that extra item you need (or desperately want!) along the way. In an emergency, I’ve made do – socks on hands for gloves etc. And no matter how great your gear is, you inevitably meet another hiker who has something “better”. Ahhh, gear envy! Secondly, when I started the AT I kept meeting hikers who’d tell me their tales of hardship about certain sections coming up. It took me a few weeks before I realised that what makes a section hard depends on so many factors – the individual hiker’s perspective and fitness, the weather on the day, if you’re with others or alone etc. One hiker’s hardship is another hiker’s paradise! It’s great to get tips about how to tackle tricky sections, but now I know to just smile through any tales of woe and make up my own mind when I do it myself. I love your blog Ray and these hiker profiles! Thanks. Thank you for these incisive comments and kind words, Ann. Your point on gear research and that it is better to start light and pick up something needed later is a good one. I, too, have worn socks for gloves. There is always a way, without becoming obsessive in having every possible gear item. Great goin’. The good and bad news is it will only take you a couple years to come down from it. But by then you’ll both be on the PCT. And that’s even better news!